We found ourselves once again spending a Labor Day weekend inland where we poured thousands of samples of Scottish whisky at the Scottish Highland Games in Pleasanton. We have a lot of fun in our whisky ambassador roles and this festive crowd loves the stuff we pour. But what a trip the games are with their motley crew of die-hard clan encampments and gawkers and weekend kilt wearers. People are serious about their period costumes as evidenced by the many hearty souls who wandered around the hot dusty fairgrounds covered from head to toe in wool and fur and heavy fabrics. Like all fairs, this annual event brings together an eclectic group of food vendors all seemingly hell bent on serving up the biggest, most gut busting-est portions of fried food imaginable. We saw corn dogs large enough to feed a family of four – seriously! And the fish & chips outlet piled up the fried potatoes in large paper baskets then topped them with what looked like runway-sized slabs of battered, deep fried fish. Never mind the turkey drumsticks and giant burgers or the towering chocolate dipped soft serve ice cream cones. In fact, never mind this belly stretching mess. You don’t go to the Highland Games for freakishly large portions of American carnival food. This is a Scottish event, after all. How about a little haggis? No? Then how about an English sausage in pastry dough and a nice ale to wash it down? Our favorite “ethnic” option came from Heritage Foods, a purveyor of some of the tastiest British-style meat pies we’ve ever tasted. A standard on the California fantasy fair circuit, these tasty hand-held pastries are deliciously savory meals in a pie shell. We snacked on steak and mushroom pies that were served molten hot (a little tricky when you’re talking about hand-held food). The pie shell is tender and simply flavored making it the perfect accompaniment to the rich beef and mushroom gravy filling. Large chunks of tender beef and slices of mushroom are filling, not stuffing. We could have eaten several of these pies, but one a year is likely enough given the oily sheen the flaky pastry left on our fingers. If you’re still eating Swanson’s frozen potpies, it’s time to reconsider the homemade meat pie. We haven’t quite figured out John Torode’s Beef cookbook (the English use parts of the cow we’ve never heard of and all the ingredients are listed in metric quantities and that’s just wrong) but the beautiful book offers several delicious iterations of this traditional British street food. We have wild Idaho Elk on hand and decided to improvise our own meat pies. Of course, you can substitute any red meat fit for braising. Give this one a try and then tell us if you still prefer the frozen factory pies from your supermarket. We think you’ll toss them out to make room for your own homemade pies! The recipe that follows is very nearly an exact reproduction of Emeril Lagasse’s Steak and Mushroom pie recipe found over here on the Food Network’s site. We give all due credit to Emeril for this fantastic iteration of a classic English dish. In a large skillet, cook the bacon over medium-high heat until browned. Transfer with a slotted spoon to paper towels to drain. Season the beef with the paprika, cayenne pepper, dried oregano, dried thyme, salt, and pepper. Pour off the bacon fat and add about 2 tablespoons olive oil and heat the pan over medium. When hot, add the beef (in batches, if necessary to prevent overcrowding). Cook until brown on all sides, about 5 minutes. Remove from the pan and add the onions, adding more olive oil as needed. Cook, stirring, until soft, about 4 minutes. Add the garlic and cook, stirring, for 1 minute. Add the mushrooms and cook, stirring, until wilted and starting to brown, 4 to 5 minutes. Add the salt, pepper, flour, and Worcestershire, and stir well. Cook, stirring, for 2 minutes. Add the beer and stock, and stir to deglaze the pan. Bring to a boil and add the bay leaf, parsley, thyme, cooked bacon bits, and return the meat to the pan. Lower the heat, cover, and simmer gently, stirring occasionally, until the meat is tender, about 1 hour. Remove from the heat, discard the bay leaf, and adjust the seasoning, to taste. Allow the beef stew to cool and then refrigerate at least four hours or over night. Preheat oven to 350 degrees. Roll out the pastry crust on a lightly floured surface. Using a round cookie cutter, or the rim of a glass, cut out the pastry dough and place each round into a muffin tin. The pastry should be just large enough to to come up to the top of the muffin tin. 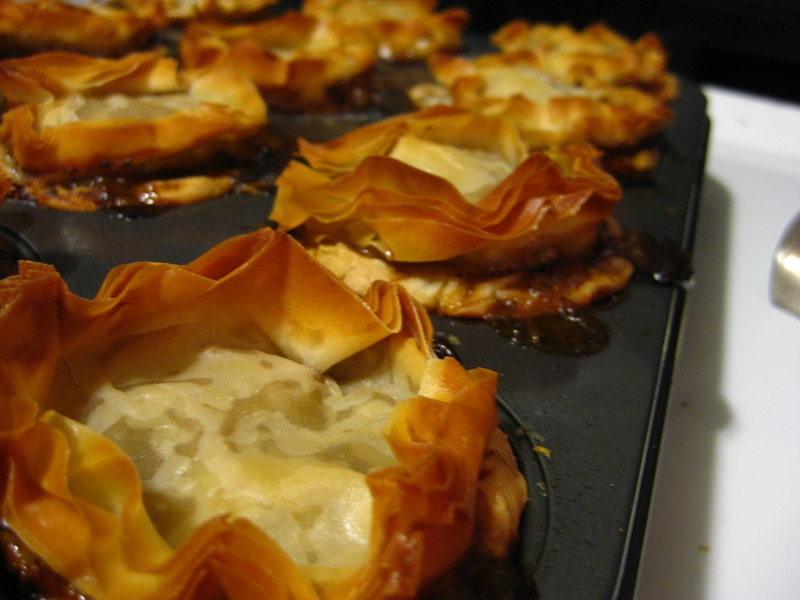 Fill each pastry shell with the cold stew and refrigerate. Sift flour and salt into a bowl, add butter pieces and blend with your fingertips until the flour mixture looks like course meal. In a separate bowl, add egg and water and beat well. Add egg and water mixture to flour and stir with a fork until the dough just starts to come together. Pour dough out onto a sheet of plastic wrap and shape into a disk. Wrap the dough and refrigerate it for at least 30 minutes. Longer is better. This dough can remain refrigerated for up to 3 days before use. « Older Post Fish Tales	» Newer Post Making Whoopie …Pies that is!